» Victoria 34 prop/shaft mounting arrangement? Victoria 34 prop/shaft mounting arrangement? Re: Victoria 34 prop/shaft mounting arrangement? I am just in the process of having my cutlass bearing replaced, on my Frances 34, and I can get the details from Vortec Marine, Universal Marina on the Hamble, who are undertaking the work. Removing the old one was something of a trial but managed in the end. That would be much appreciated Jon, especially if yours looks like mine! I suspect if I want to remove mine, I'm going to need to drop the rudder - was that true with yours? As I have my propeller removed pending the delivery of my new one, I intend removing my cutlass bearing for inspection too. The setup looks almost identical to yours Duncan. I wouldn't have though that you need to remove the rudder as there should be enough space between the end of the shaft and the forward face of the rudder. I'll provide an update within the next few days all being well. A bit later than planned and perhaps you have already had your cutlass bearing sorted Duncan? Paul will attach some relevant photos, but between times, both my and William McCauland's V34's have identical cutlass bearing hardware. Both boats were built in 1990, so that will obviously carry some weight to them both being the same I guess. Based on some info from Darglow Engineering, several V34 and Francis 34's have slightly different arrangements which include longer shafts to accommodate rope cutters. In our cases, the cutlass bearing assemblies can be removed off the end of the prop shaft without needing to remove the rudder (or engine if you prefer to withdraw the shaft internally). Anyway, the prop shaft on my V34 is 25mm in diameter. The cutlass bearing has an inner diameter suited to the 25mm shaft and an outer bearing shell diameter of 40mm. The bearing when housed in the bronze casting is only 50mm. The standard bearing length is 100mm. I had to cut through the bearing using a large hacksaw as there isn't an internal lip available to press or drive the old bearing out, i.e. it is flush internally with the wall of the bronze cutlass housing (I hope this makes sense??). I greased and pushed the new bearing into the bronze housing and then tightened the 2 grub screws. I then used the large hacksaw with some 'Rocol' cutting fluid to remove the protruding 50mm worth of bearing. 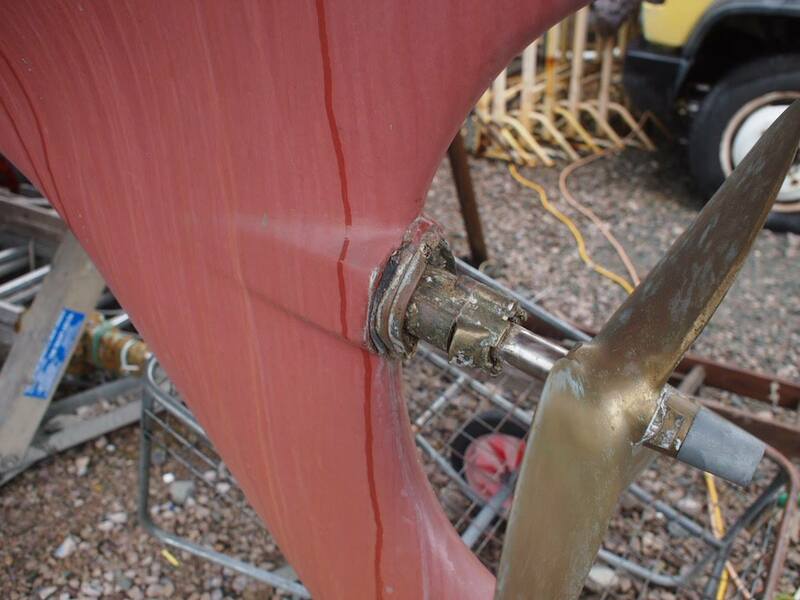 I should have said the two bolts that secure the cutlass bearing are easily removed, however, a large stilson spanner will be needed to remove the cutlass housing (rotates anti-clockwise when looking end of from the propeller or stern) from the end of the stern tube. Thank you Charles, that's very helpful, and I can pass it on to the local yard. I've had the rough estimate from them, and they've not met this bearing assembly before, so being able to give them some info will help. Looking at your first picture and last picture, I take it that's the "forward" part of the assembly that's bonded to the hull with bolts and sealant? I'd be a bit worried about putting a hacksaw into it to get some grip, solely because it weakens the bearing a bit (not that there should be lateral load on it). The two cutlass holders above do not look the same. Charles's looks the same as the one on my boat, but Duncan's looks as though it is split half way along - undo the two machine screws (should be bronze bolts) and half of the holder comes away. The Cutlass is held by a grub screw or bolt either from above or below, and can then be pulled out - ie the holder does not need to be detached from the stern tube in the same way. Good point Jonathan. I think the prudent course of action is going to be to lift the boat out for the scrub and anti-foul, and disassemble the stern gear at that point, measure everything, and order the replacement bits. It'll mean a hard-standing charge, but it's probably better than ordering a bit that doesn't fit right. I'm fairly confident that the shaft diameter and bearing diameter are not different, but there could have been changes in equipment depending on what was available at the time. Either way, it'll get documented, and posted here/on my blog. The stern gear on my V800 was identical and the shaft was 25mm dia. It had Vetus stamp on it. I took it to the Vetus stand at Southampton boat show but none of their reps recognised the design. It was removed because I had a serious leak from a cracked stern tube. When I pulled the sterntube it was made of thin wall tube and as fragile as an easter egg shell. It was easily pulled apart without tools! The cutless bearing had to be cut out of the fitting (1" /25mm mismatch). I have replaced stern gear and tube with far more robust made-to-measure gunmetal fittings from Sillette-Sonic Ltd [Type 1]. On the inboard end the fitting was sized and machined to take a Volvo shaft seal. Now I just have to trace a deck leak and I should have a dry bilge! The local yard has had a chance to look, and has been on the phone to Vetus who confirmed its one of theirs, no longer manufactured. In this case, the hull-side part has been brazed to the stern tube, and I have pretty bad electrolysis damage. The yard is confident that the stern tube is cemented in, so will be a non-trivial job to remove it. They've also indicated that they've never worked with this particular setup, so I'm now doing research to find out what my options are - they can put things back together for now and put her back in the water, and she'll be usable. https://www.cricalix.net/2018/06/13/cut … -troubles/ has photos. I drew the shaft when the engine came out last year. The cutlass bearing was replaced by our marine engineer but I couldn't give you any details, only it seemed a standard sort of job and part. I hope you have it sorted now. Sailed into Dun Laoghaire mid week and saw Blue Opal on her mooring looking very smart. I think you are somewhere at sea right now otherwise we could compare notes. Hopefully we will have enough wind for the transit back to Holyhead or Caernarfon on Monday 9th. Hope you enjoyed your stop here, and perhaps even made it over to the Sunday market. My wife visited the Sunday market and brought some food back to the boat. We did Dublin on Friday and had lunch in Bewley's Grafton street. Glad to see its finally open again. We sailed on Monday morning in no wind until we got to Kish light, then a front came over and the wind filled in giving us up to 20 knots but close hauled. Stopped over in Holyhead overnight on a club mooring and back into Conwy last night after 31 days out. Hopefully we shall have another bash before the season's over. I hope the work in Pwllheli goes well. Well, the work is still in progress. It's taken a while to get going - people apparently like to go on holiday in summer (plus the yard and engineers were busy with existing work). Blue Opal's stern tube has been cut out, and the next step is fitting a new tube and determining a new outboard gear setup.